I've been a Carey Mulligan fan since 2005, and I absolutely adored her in 2011's Drive with Ryan Gosling, but the real joy here—for me—was the stillness and absence-of-drama portrayed by 2012's Rust & Bone Matthias Schoenaerts. He's been acting since 1992, but we don't get a lot of Belgian films stateside! I look forward to catching his performance from 2014's sleeper, A Little Chaos, due stateside soon. 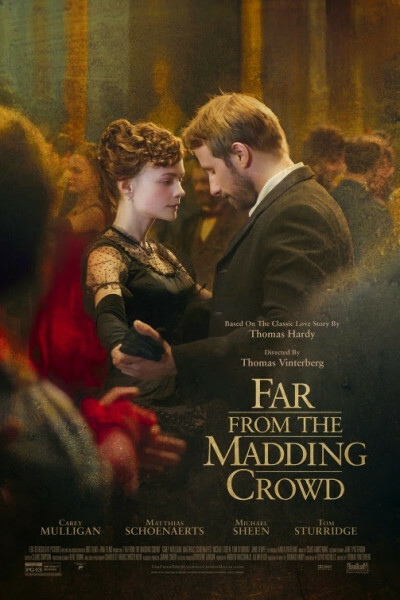 Following Age of Ultron and Mad Max, Far from the Madding Crowd is precisely that, reminding me that I very much long to die in an open field when the time comes! Dorset, what a gorgeous place. England's Vermont, and that ain't a bad thing. I'm told that if one loves period films, this won't make the top ten, so I won't bother suggesting that it is or isn't. I will, however, suggest that if you support BBC Films, you could do worse than seeing this one, and at nary $3M in box office receipts, it needs all the support it can get, otherwise, what we see stateside will remain a trickle, and that's a tragedy.